One of our knowledgeable and market savvy real estate advisors will personally assist you in exploring the best possible opportunities, either as an investor or as a home seeker. 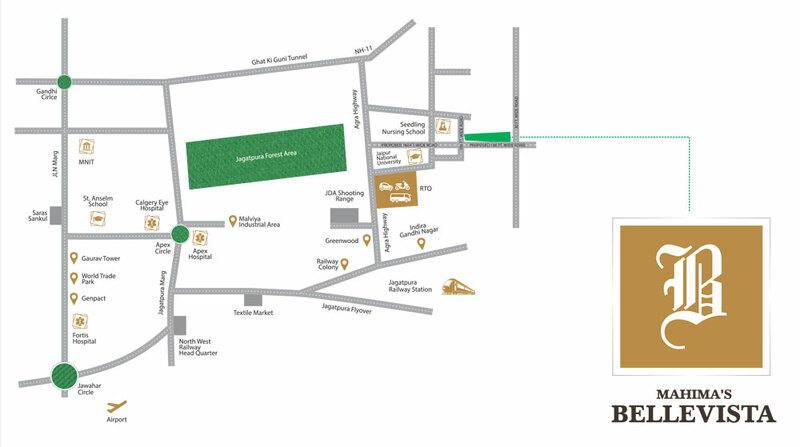 Mahima Bellevista Jaipur: Experience the ambience of luxury and sophistication! For a life extraordinaire, is Mahima Bellevista,on offer by the renowned realtors of Rajasthan, Mahima Group. These ready to move in 2 and 3 BHK residences are located in the fast developing area, Jagatpura in Jaipur. Aimed to give the budget buyer a lavish yet modern living experience, these apartments have been planned and executed meticulously. Three magnificent towers of 13 floors each, will house aesthetically designed, Vaastu-compliant apartments with sizes ranging from 897 sq. ft. to 1396 sq. ft. Experience the sense of serenity and enthusiasm for an exciting lifestyle at Mahima Bellevista Jaipur. Enticing amenities included are a gymnasium, club house, children's play area, party lawn, reading lounge, and a senior citizens’ sit-out area. For the sports enthusiasts, there are jogging tracks, billiards table, multipurpose court, swimming pool and table tennis. Facilities like 24x7 water supply & power backup, fire-fighting systems, intercom and ample car parking will make urban city living comfortable. The entire area has paved compounds and landscaped parks. The interiors too have been planned in such a way to allow for maximum ventilation and natural light. They have been finished with high standard specifications in keeping with the trends today. 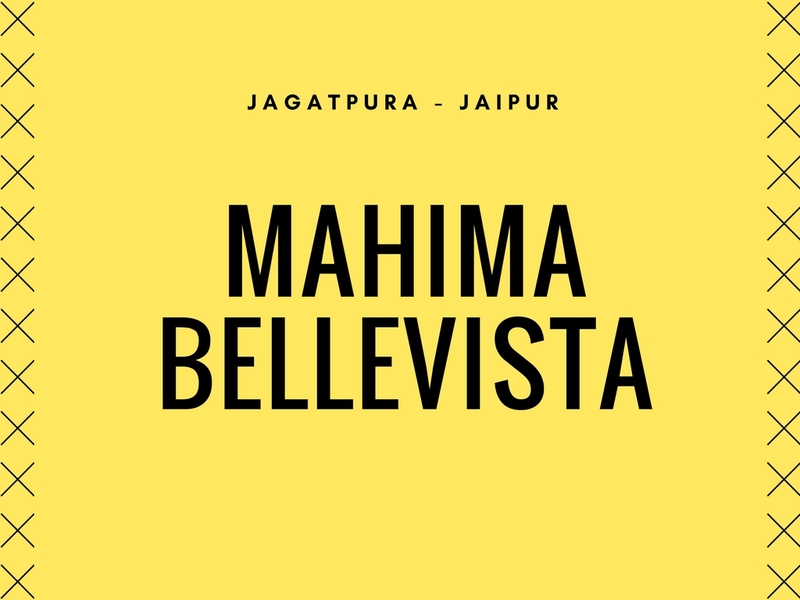 Surrounded by the exotic Aravali Range, Mahima Bellevista Jagatpura has an enchanting view as well as a peaceful environment. It is on the F-1 Govind Marg, next to Hotel Ramada in Raja Park of Jaipur. The area is one of the fastest developing areas and is well-connected to all important access points of the city. Numerous malls, schools and commercial centres are here, giving the residents a complete neighbourhood. The well-established Mahima Group has completed praiseworthy commercial and residential projects over the last 27 years, greatly enhancing the infrastructure in Jaipur and Rajasthan. With both luxury as well as budget projects being their forte, they have reached out to thousands of esteemed customers with their high-quality projects. As the market leaders in Rajasthan, they have over 19 completed projects to their credit.They take pride in the fact that 4 of the commercial complexes developed by them have become iconic landmarks of the city. The malls developed by them have over 100 plus national and international brands in them. Rs.29.57 lakhs to Rs. 45.03 lakhs is the Mahima Bellevista price range, which is purposefully kept affordable for the mid-segment buyer. Their projects have an endearing ambience of sophistication and comfort where individuals can live out their aspirations and take pride in their homes. Would you like to speak to one of our financial advisers over the phone? Just submit your details and we'll be in touch shortly.